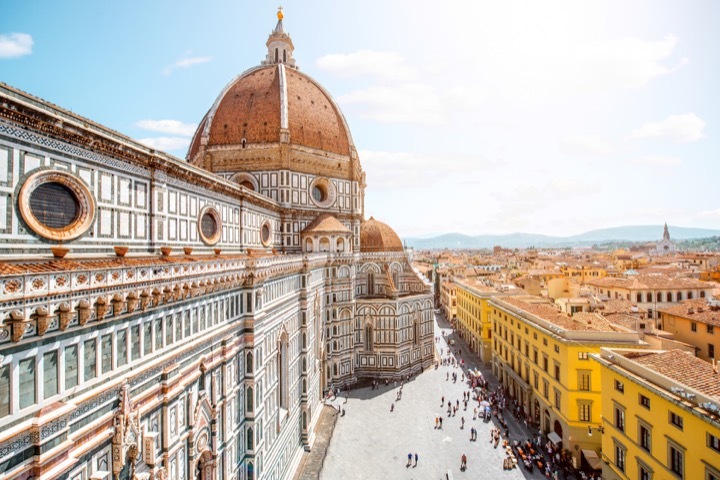 ToursByLocals Blog - Five Must-Sees in Fabulous Florence! Five Must-Sees in Fabulous Florence! The jewel of Renaissance Italy. A city of timeless beauty. A financial powerhouse and artistic treasure trove. Once even (briefly) the nation’s capital. Full of family legacies and modern imaginings, Florence is a city to savour. If you’re lucky enough to be planning a trip here, pour yourself a glass of Chianti and read on! Our local guide Valentina joins us today to share her five favourite things to see and do in her fabulous hometown. Here you’ll find one of the most important painting collections in the world, gathered in chronological order, which allows one to understand the evolution of Italian painting from Giotto through Botticelli, Leonardo da Vinci, Michelangelo, Titian, Raphael and many more. However, it is easy to walk through this gallery and miss the message, the meaning and history behind the key pieces. What is the best way to organize your visit? With an expert by your side explaining what you're seeing and providing you with tools to understand the context of the artwork. An absolute must see in Florence. David, sculpted from 1501 to 1504, is a masterpiece of Renaissance sculpture and one of Michelangelo's greatest works. Also, stop by the unfinished Michelangelo’s sculptures in the corridor leading up to David. They give insight about how an artist takes a huge block of marble and turns it into a masterpiece. (Suggestion, pre-book your tickets with your tour guide to avoid line-ups). Come here for a breathtaking view over the lovely roofs of Florence. The Piazza overlooks all of Florence and is the best place to come for a view of the city (and some great photos!) It’s easy to reach Piazzale Michelangelo: walk up the stairs or pathway or get up there via Bus no 13. Get ready for a view that you will never forget! This is my favourite ice cream place in Florence! I love their “ricotta and fig” flavor. Neri has 3 display cases with upwards of 45 gelato flavors to choose from. All smooth and creamy and the flavours really pop in your mouth. Price-wise Neri is one of the most reasonably priced gelaterias in Florence, and the quality is phenomenal...give them a try when you’re in town. See living history at this 16th Century market in Florence. Also known as “Mercato del porcellino” (Little pig’s market) due to the wild boar fountain located by the market. Many tourists come to rub the pig’s nose and throw a coin in the fountain. It is believed that doing so ensures a return trip to Florence. In the market, vendors are selling belts, scarves, leather goods and souvenirs. The market is open year-round, with limited hours during the winter. Stop by Roberto’s restaurant “Grotta Guelfa” just behind the market and enjoy Florence’s traditional meal of “Pappardelle al cinghiale” (wild boar) with a glass of red Chianti wine! Thanks to Valentina for these great suggestions on how to spend time in beautiful Florence, Italy. If any travelers are headed to Florence in 2018, consider getting in touch with Valentina to gain insight into this city’s astonishing history of art – or maybe just to get directions to the best gelato in town.